I realized I never posted pictures of my finished Off the Rail quilt top. I know I showed you all pictures along the way as I cut and made the blocks. I am super happy with how the finished top looks. 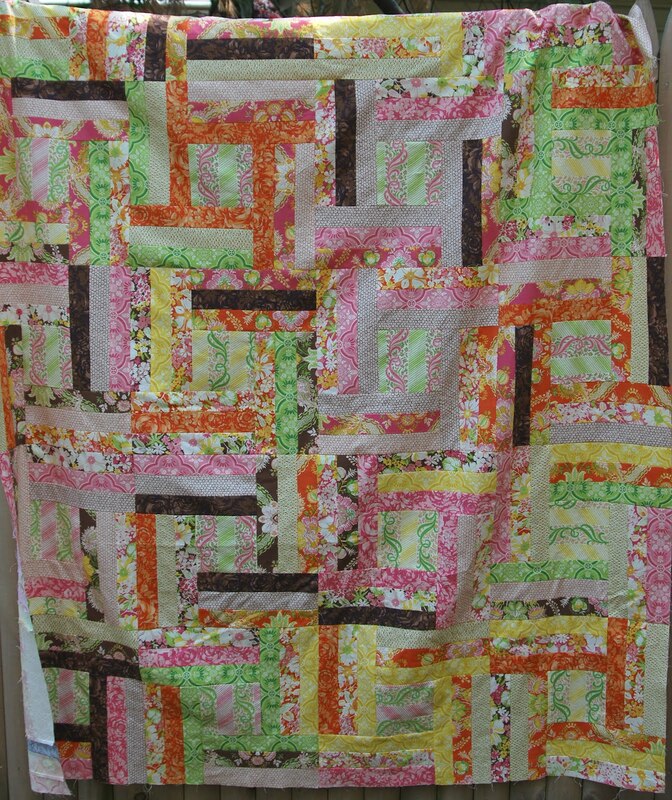 The sad part is that I have no idea when I will actually get to quilt it. I move so quickly onto the next project my "to quilt" pile is getting pretty tall. Julie of JayBird Quilts makes absolutely fantastic patterns. Her directions are clear, and the pictures make it so that you see exactly how things are supposed to come together. This however, did not stop me from getting some of the blocks sewn together backwards. Honestly, I cannot fathom how I did this...if you look at these two blocks, you can see they are headed in opposite directions. That's not how it's supposed to be. I did the blocks in groups of 5, and at least one of the groups, I managed to put the first set of rails on the wrong side of the center block and get them backwards. Can you say "duh"? Thankfully though, I absolutely LOVE how it looks finished. This will for sure be a keeper when I do manage to quilt it. I originally was afraid of how the pink and orange would look together (along with green and brown). All that doubt is out the window now that it's together. Yeah, this is really gorgeous (colors, pattern, everything)!